The campaign aims to raise awareness of mental health issues and help young people to share their experiences and advice using the hashtag #weRallbananas. My friend Laura Degnan who is behind the campaign told me “It’s a tongue in cheek way of highlighting that everyone will be affected by mental health issues in some way at some point in their lives. I liked the idea. Far too many people suffer in silence around issues of mental health. To have a mental health issue can still be seen as taboo. Yet the majority of us will be affected by it, in one way or another. 1 in 4 people will suffer some sort of mental health disorder in their lifetime. So with mental health issues being so commonplace, why do people still struggle to talk about it and get help? Most of us would have no issues going to the doctor when any other part of our bodies doesn’t work quite right. Yet we still feel ashamed when it’s our mind that’s not fully healthy. This needs to change. There should be no shame at all to admit we have mental health issues or concerns. It is normal. We are all bananas. The more we can acknowledge this, the more likely it will be for people to speak out, to get help or advice. Mental health concerns like any other health concern should not be neglected. I’ve had times in my life when I’ve needed to stop, to acknowledge my mind and emotions weren’t in the best place and do something about it. The worst thing I could have done at those times was just keep going and pretend everything was ok. You can’t run on a sprained ankle for ever. You need to give it time to heal. The mind is no different. Healing can take many forms, rest, relaxation, talking therapies, behavourial therapies, counselling, medication, diet. Once we get help and advice, we can find the best way to manage our mental health. That’s why I got involved in the campaign; to encourage people with concerns to speak to somebody. The idea is to flood social media with positive messages and good advice for mental health – by writing them on bananas, taking a selfie with you and your banana and posting it on social media. 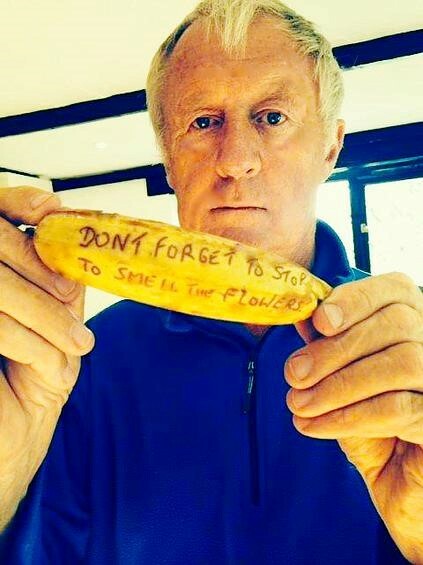 Even Chris Tarrant has been getting involved. If you want to get involved too, simply write your best bit of advice on a banana, take a selfie and post it to Facebook, Instagram or Twitter using our #weRallbananas hashtag and the message ‘My good advice 4 #weRallbananas. Visit http://www.youthspeakmh.com. Txt donate MSMD10 £2 to 70070.’ Then nominate others to do the same. If you are someone who has a concern about you or someone else’s mental health, speak out. Don’t be ashamed. You are not alone. You are normal. We’re all bananas.